Protein shakes are a great on the go, or post workout meal when you are looking to lose weight or build muscle mass. They can provide nutrients necessary to get you to your next meal, replenish depleted nutrients from your workout, and even curb that sweet tooth. There are a million protein powders on the market with different protein sources and flavors. Finding the right one for you might require a bit of trial and error. You want to make sure it contains at least 20g of protein per scoop, tastes good, and digests well. Also, check the ingredient list. Try to pick ones with shorter more recognizable ingredients and no added sugar. Whey protein is one of the most commonly used proteins and is best for day-to-day use. It contains all of the essential amino acids and is easily digested. It helps boost energy and can reduce stress levels. Whey isolates and concentrates are best to use after a workout. Rice protein, which is 100 percent plant-based, is a good choice for vegetarians or for people who don’t consume dairy products. It’s also gluten-free. The most common liquids are water (no added calories!) and unsweetened almond milk, but you can also use cow’s milk, unsweetened soy milk, unsweetened hemp milk, tea, and coffee. Adds a little natural sweetness to your shake and gives you healthy carbohydrates. I generally like to add frozen fruit* instead of fresh to mine to give more of a smoothie feel, but either is fine! *Be sure to check the ingredients on your frozen fruit to ensure there are no other added ingredients. Or freeze your own! Throwing veggies into your shake is an easy way to fit 1-2 of your servings in. Spinach is usually my go-to, it blends easily, and you don’t really taste it. Another one that is fun to add in the fall is pumpkin. Other options include (but not limited to): kale, swiss chard, beets, cucumber, and celery. Fats added to your shake will help slow digestion and keep you full longer. In addition, we need healthy fats in our diet for energy, to balance hormones, transport fat-soluble vitamins, balance inflammation, and aid in immune function. Some good options are avocado, walnuts, flax seeds, chia seeds, hemp seeds, cashews, almonds, and nut butters. Often times I will add cinnamon to my shakes, but plenty of other spices work too: ginger, nutmeg, cardamom, turmeric, coriander, cayenne, cloves, vanilla extract, allspice, etc. Get creative! Use 1/2 cup for a cold smoothie consistency. *Note: Not all ingredients are necessary, just healthy suggestions to help build and spice up your shakes. 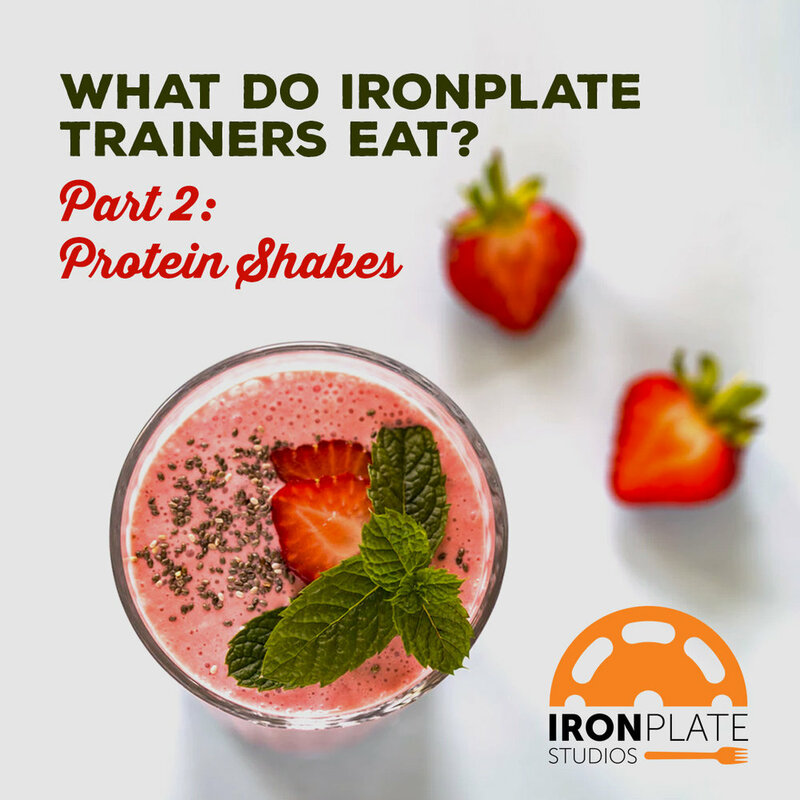 Consult with your IronPlate trainers and nutritionists to help you determine what combinations might be best for your personal goals. ¾ cup either water, milk, unsweetened almond milk, etc.